Acknowledged author Neil R. Carlson wrote Physiology of Behavior comprising 736 pages back in 2016. Textbook and etextbook are published under ISBN 0134080912 and 9780134080918. Since then Physiology of Behavior textbook received total rating of 4 stars and was available to sell back to BooksRun online for the top buyback price of $98.33 or rent at the marketplace. 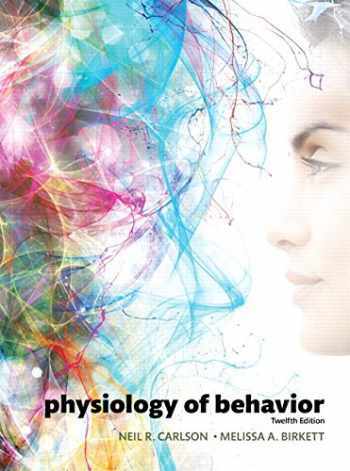 For courses in Physiological/Biopsychology An up-to-date, comprehensive, and accessible overview of behavioral neuroscience Physiology of Behavior provides a scholarly yet accessible portrait of the dynamic interaction between biology and behavior. Lead author Neil Carlson and new co-author Melissa Birkett drew upon their experience teaching and working with students to create the new edition of this comprehensive and accessible guide for students of behavioral neuroscience. In addition to updated research, the Twelfth Edition offers an updated art and visual program and a more robust learning architecture that highlights key concepts, guiding students through the text. Physiology of Behavior, Twelfth Edition is also available via REVEL™, an immersive learning experience designed for the way today's students read, think, and learn.